public domain image from USDA National Wildlife Research Center media archives. I'd like to give mammals some blog time here in this season of migration. I'll call this a story about Dispersal rather than Migration but interesting none the less. A cougar (a.k.a.mountain lion), was treed in Spooner Wisconsin this month. This is big news because just like in Minnesota, the common wisdom of the DNR used to be that there are no cougars here. What they usually say now is that there are no breeding populations. What we do get are "stray" animals, usually juvenile males that get kicked out of breeding territory in the Dakotas and start heading East. These are BIG animals and they can cover a lot of ground. A cougar was spotted at the border of the nature center where Paul and I work a few years back. I usually dismiss all such reports but the neighbor who spotted it is a former naturalist at the center so her credibility at identifying wild animals is higher. Still, even given that, I only put the chance that it was actually a cougar at 75%. This isn't to discount her observation. Even if I had seen it with my own eyes I would only go as high as 80% probability. Our eyes deceive us. Scott Weidensaul explores the idea of big cats in the woods in his book, The Ghost with Trembling Wings. He feels that having a top predator in the woods makes you experience the environment differently. I completely agree. In those days after the possible cougar was spotted in the woods I went on a few hikes and the woods did feel different. I experienced them with a heightened awareness and a keener attention to my surroundings. I also brought my walking stick, just incase. The odds of encountering a cougar in the woods is extremely low. The odds of one wanting to make a snack of you is even lower. More people are killed by dogs than mountain lions. 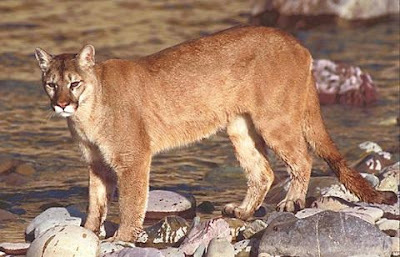 From 1991 to 2003 an average of 0.8 people per year in the US and Canada were killed by Cougars. (5.6 per year on average were attacked). Still, as a naturalist I am aware that to survive a cougar attack you have to fight back. This is assuming they don't instantly sever your spine at the neck. You have to show them that you are too much trouble to mess with. This is the same tactic to take with a black bear once it attacks. Going into the woods knowing you may end up wrestling a cougar or a black bear (however unlikely) makes the woods a different place. It makes it wilder and more intact. If there really were a cougar at the nature center it was probably long gone by the time we heard about it. Black bears are different. They are there, probably every day I step outside. I don't really think about them though. A black bear will attack if it feels extremely threatened or if it feels you threaten the cubs but we're not on the bear menu. Bears don't hunt people. Cougars, at least in theory, have hunted people out west. Maybe we need a cougar around once in a while to remind us of our place in the woods.